The Shēngxiào Collection is a twelve year series from the Royal Mint following one complete cycle of the Chinese Lunar Calendar. It features the 12 well known zodiac animal signs, and coins are produced in gold and silver bullion and proof formats. These are the first ever legal tender lunar coins made by the Royal Mint. You may also be interested in the Perth Mint lunar collection from Australia. It is currently comprised of two series; the first cycle running from 1995 to 2006, and the second from 2007 to 2018. The first two coins in the Shēngxiào series feature the fourth official portrait of Queen Elizabeth II, as designed by Ian Rank-Broadley (initials IRB). The Royal Mint transitioned to the fifth portrait, by their own design head Jody Clark (initials JC), in 2016. The lunar coins produced from 2016 onwards bear this likeness. The majority of the reverse designs are created by Wuon-Gean Ho, a British-Chinese artist. So far she has produced the first five coins in the series, with Harry Brockway designing the new 2019 Pig coin. BullionByPost are proud to be a fully authorised Royal Mint distributor, bringing our customers these exquisite collectable coins. 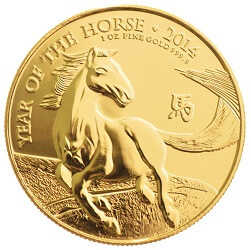 The 2014 coin depicting the Year of the Horse had a clever addition to the design on the reverse. The Uffington Horse can be seen beneath the horse's feet. This is a prehistoric white horse which stands out as it was carved into the chalk hills of Oxfordshire. The artist, Wuon-Gean Ho, lived in the area and felt it would be a nice touch to commemorate her origins but also a smart way to link Britain's heritage to the Chinese Zodiac. Years born into this sign: 1930, 1942, 1954, 1966, 1978, 1990, 2002, 2014, 2026. Due to the interpretation that the Year of the Sheep may instead be the Year of the Goat, the design of this coin features a horned sheep, based on the Bighorn Sheep native to North America and considered a middle ground breed between the two species. Years born into this sign: 1931, 1943, 1955, 1967, 1979, 1991, 2003, 2015, 2027. Artist Wuon-Gean Ho chose to depict the rhesus monkey on the 2016 coin. Monkeys have strong symbolism in Chinese folk tales, especially gibbons, with stories about monkeys having abilities such as speech and the capacity to transform into humans. One such tale is of the deity Sun Wukong, featured in the 16th Century novel 'Journey to the West'. The monkey was said to have come to life from stone and possessed incredible strength, speed, and wits - abilities that led him to challenge the mightiest warriors of heaven. His punishment for rebelling was to be imprisoned beneath a mountain by Buddha, but he was later freed to complete a quest to the west with a Taoist monk to reclaim sacred scrolls. Years born into this sign: 1932, 1944, 1956, 1968, 1980, 1992, 2004, 2016, 2028. Some coins, and indeed some translations, call this year the Year of the Cockerel. The difference is negligible - a rooster is a cockerel that is around, has been introduced to, hens for breeding purposes. Years born into this sign: 1933, 1945, 1957, 1969, 1981, 1993, 2005, 2017, 2029. In 2018 the Royal Mint produced their Year of the Dog coin, featuring a Terrier - one of the most popular small British dog breeds - though ironically bearing more of a resemblance to the Australian Terrier. Years born into this sign: 1934, 1946, 1958, 1970, 1982, 1994, 2006, 2018, 2030. You can view the 2018 Year of the Dog as a 1oz gold coin or a 1oz silver coin. This coin is the first to be designed by someone other than Wuon-Gean Ho. Instead it was wood sculptor Harry Brockway who created this image of piglets suckling their mother - one of the Large White breed of pigs that are commonly farmed in the UK and derived from the Yorkshire breeds. Similar to the Sheep coin, the Year of the Pig can also be known as the Year of the Boar. Years born into this sign: 1935, 1947, 1959, 1971, 1983, 1995, 2007, 2019, 2031. We currently have stock of both the 2019 1oz gold coin and the 1oz silver coin. Like several of the other zodiac years, the Year of the Rat can also be known as the Year of the Mouse. More information will be added nearer the coin's release date. Years born into this sign: 1936, 1948, 1960, 1972, 1984, 1996, 2008, 2020, 2032. Years born into this sign: 1937, 1949, 1961, 1973, 1985, 1997, 2009, 2021, 2033. Years born into this sign: 1938, 1950, 1962, 1974, 1986, 1998, 2010, 2022, 2034. Years born into this sign: 1939, 1951, 1963, 1975, 1987, 1999, 2011, 2023, 2035. Years born into this sign: 1940, 1952, 1964, 1976, 1988, 2000, 2012, 2024, 2036. Years born into this sign: 1941, 1953, 1965, 1977, 1989, 2001, 2013, 2025, 2037.